Much cheaper and faster than going to the main dealer. We have a fully trained auto locksmith that is able to safely, and without damage, pick open your car door lock or manipulate the locking mechanism to gain entry to your car to remove the keys that have been locked in. Or, if you have lost your keys we are able to cut and code a new key to your cars computer system so you are back up and running as soon as possible. 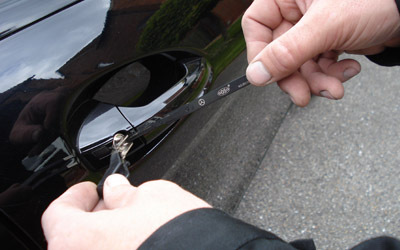 Emergency car opening service for keys locked inside the car or the boot. Supplying, cutting and coding new keys and remote key fobs for your car; no matter what the make or model we have the solution in a 1 hour turnaround time. 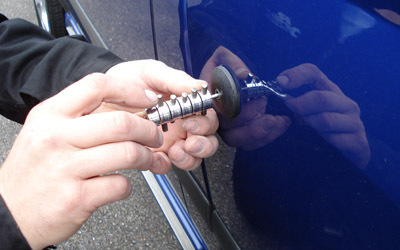 Removing broken keys from lock barrels, without damage, so the lock can be used again which saves a lot of money compared to replacing the lock barrel. Replacing individual lock barrels or full lock sets if you think your old keys have fallen into the wrong hands. Repairing and reprogramming broken remote controls and key transponders (transponders are a small signal emitting circuit inside the key that are energized by a radio frequency that the car sends out when looking for a key and if the signal comes back correct it will allow the car to start). Immobilizer bypasses if it is causing an intermittent non start situation. Much more cost and time effective solution than smashing the car window! 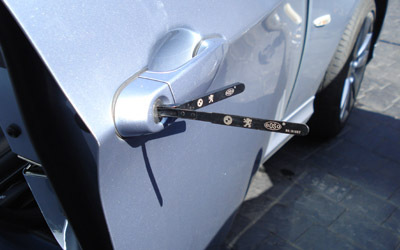 We use state of the art Lishi lock picking tools that will not cause any damage to your car or the lock.